Robotic technology has advanced dramatically over the past few years, and we are now living in an era where robots can help businesses of all sizes increase productivity and profitability without breaking the bank. These systems are relatively inexpensive to obtain, easy to deploy and easy for technicians to manage. They don’t replace human employees, instead, they help scale your team and maximize production. Universal Robots, a Danish manufacturer is one company that has been at the forefront of the collaborative robotic industry and today has sold more than 24,000 collaborative robots which are used all over the world. 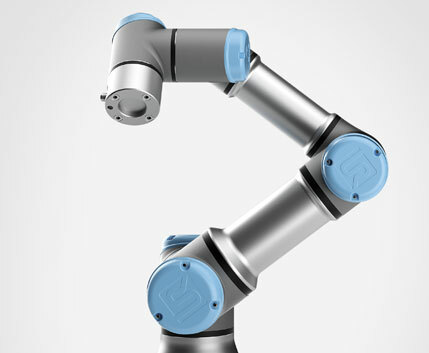 Their small, flexible, 6-axis industrial collaborative robotic arms referred to as, “Cobots” have numerous features and benefits that once utilized can significantly impact your business’s bottom line in a variety of ways. Read on for a few reasons your shop should consider investing in a Universal Robot Collaborative Robot. The ease of programming is one thing that separates Universal Robots cobots from other robotic companies. Their patented technology allows operators with no programming experience to easily and quickly set up their Cobot. 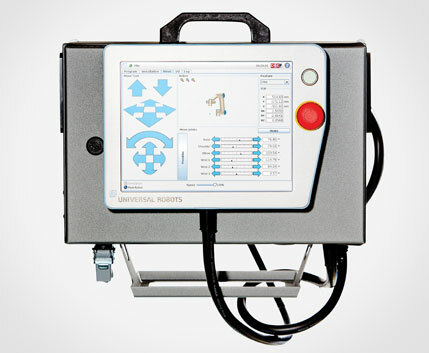 The entire programming sequence is as simple as moving the robot arm to the desired waypoints by hand or by touching the arrow keys on an easy-to-use tablet. Once the waypoints are saved the programming is done–it’s as easy as that! The entire setup process moves from what would normally take weeks to deploy to a matter of hours. The out-of-box experience for an untrained operator to unpack and run the first simple task is typically less than an hour. After the simple programming, a robot will work consistently and quickly to complete its task or series of tasks. The robot won’t get fatigued, it doesn’t need to stop for a lunch break, and it doesn’t leave at the end of a shift. In fact, when it comes to repetitive tasks, a collaborative robot will work quickly and efficiently day in and day out, helping your business maximize output. Another great benefit of Universal Robots cobots is their advanced safety features. No longer will your shop need fencing, gates, or other bulky restrictive safety systems. Instead, you’ll be able to work directly beside and with the robotic arm bringing you closer to your machine shop processes. This is all due to Universal Robots built-in force sensing technology and intuitive 3D visualization. These patented features give your cobot a true sense of their environment and the ability to stop immediately when encountering resistance or impact from human workers. Universal Robot has concluded that around eighty percent of UR robots worldwide operate with no safety guarding after risk assessments. With the advanced safety features that come along with Universal Robots cobots, you can finally replace operators in dirty, dangerous jobs that can result in accidental injury. Instead, you’ll be able to utilize the full potential of your employees, freeing them up to do more meaningful and safer work which can create growth opportunities for everyone. Load a machine, run a press brake, stack finished parts, weld steel, sort materials, and more – the opportunities to automate repetitive production tasks are almost endless. From simple “pick and place” tasks to complex, intricately programmed movements, a collaborative robot can take on just about any job with speed and precision. With various models of robot arms to choose from, and even more end-effectors and accessories, we can help you select the best model for your particular needs. The smallest of the group, the UR3 is ideal for smaller projects. The UR5 is equipped to optimize low-weight collaborative processes, such as picking, placing and testing where the UR10 is a larger cobot designed for bigger tasks where precision and reliability are still of paramount importance. With a wide variety of end-of-arm tooling available for today’s robots, we can outfit a robot to perform or support almost any manufacturing process. Take a look at the video below to see a few of the thousands of possible ways to integrate your UR collaborative robot with other machines processes in your existing production environment. If you’re interested in learning more about how a Collaborative Robot from Universal Robots could help your business, contact us today. As an official representative for industry leader Universal Robots, we can help you choose the perfect collaborative robot for your unique application. And as experts with decades of experience in manufacturing and fabrication, our team can identify ways to help your business increase productivity and profitability with a Universal Robotics automated solution. Contact us today to learn more. We look forward to helping your business take advantage of the latest in robot technology!